Posted by Megan in Science Fiction. From YA author Victoria Schwab (Near Witch, 2011, The Archived, 2013), comes a new adult science fiction novel. When Victor and Eli first meet in college they are both ambitious and arrogant and slightly socially awkward. During their senior year a shared interest in near-death experiences and super human powers lead them to pose an interesting hypothesis. They believed that under the right circumstances it was possible for certain people to gain extraordinary powers. This was interesting as a theory, but deadly during the experimental phase. Ten years after that fateful semester Victor has escaped from prison and is hunting down his former friend. Fortunately for Victor, Eli is also on the look out for Victor as part of his crusade to eliminate ExtraOrdinaries (EOs) from the world. Both men are fueled by rage, armed with terrible powers, and dead-set on revenge. 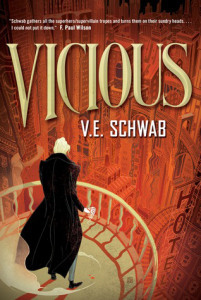 Though marketed as an adult novel, I think high school readers would probably enjoy this book, so if you are a fan of Victoria Schwab, you might want to check out Vicious. If you like enjoy stories where the lines between good and evil are blurred, you will probably like the moral ambiguity in this book. If you are intrigued by the idea of having superpowers, you should probably read this book. It might change your mind! Are you a fan of revenge tales? That’s Vicious! Looking for complex friendships, unlikely heroes, and strange friendships? Look no further! If you like your reading deep, dark, and dangerous you will find all of that here. Bottom line: this book is fabulous! I found the cover off-putting, so this is a perfect opportunity to NOT judge a book by its cover! The first book that comes to mind is Steelheart by Brandon Sanderson. Both tell the story of extraordinary powers corrupting people. I’ll have to think about more readalike!